I speak with hundreds of store owners every year and few – if any – mention blogging as a meaningful part of their strategy. But if you get it right it can be amazingly powerful. Nail it and you’ve built yourself an ongoing source of free traffic to power your store and sales growth. My guest today, Andy Hayes from PlumDeluxe.com, talks about how to grow a blog and how they’ve used the platform to generate close to two-thirds of their sales. Andrew: Welcome to the “eCommerceFuel” podcast, the show dedicated to helping high-six and seven-figure entrepreneurs build amazing online companies and incredible lives. I’m your host and fellow eCommerce entrepreneur, Andrew Youderian. Hey, guys, it’s Andrew here and welcome the “eCommerceFuel” podcast. Thanks so much for tuning in with me today. And today, I’m day kicking off a two-part series, I feel like PBS or something here, on blogging, of all things. We actually had somebody post in the private forum recently asking about if anyone was really killing it with blogging. And I wasn’t expecting to see anything blow up really. I talk to a lot of store owners. Very few of them, I would say, see a really meaningful percentage of their sales and traffic come from blogging. And in the past, too, there have been threads that we have in the community where people say, “What big eCommerce companies are really doing well with blogging?” And there’s a couple that were mentioned, but by and large, it was a fairly quiet discussion. And so that was really interesting. A couple people chimed in and talked about their experience and their success blogging. One of those, you know, I guess, today on the show, Andy Hayes from plumdeluxe.com generates almost two-thirds of his sales from blogging, which just blew me away. And so I wanted to get him on the show to really talk about how he does that and the strategies that he employs and how long it’s taken him. So, we talked about all of those things, his thoughts on finding really good writers, about getting people to opt-in for that, his strategy on in terms of keyword research and SEO. He would definitely, as you’ll hear, will probably advocate a balanced approach or at least having some blogging content that does more lifestyle, that’s not purely mercenary in terms of just targeting keywords. But I would say, if I had to summarize his standpoint, he’s very much focused on that keyword approach and it’s worked incredibly well for him. So, part of the cool part about this two-part series is we’ll be talking about his experience and his approach today heavily weighted on very substantial keyword background and SEO background. And next week, I’m gonna follow up with another episode that’s almost a reverse of that, maybe thinking about SEO a little but focusing much more on the content on lifestyle pieces on just things that are of interest to the readership with less of a priority on really nailing that SEO and how that’s going. So, give you a couple perspectives there. So, I’m gonna stop rambling and get into my discussion today with Andy on blogging. Andy, so, give me a sense of what percentage of your site’s traffic and sales that you can either tell or estimate are coming through as a direct result of the blog? Andy: Well, I had a feeling you were gonna ask me this. So, I actually looked it up. I would have just said a lot. Andrew: Did that have anything to do with the fact that I sent you the question list ahead of time? Andy: I would have just said a lot, which people would be like, “Yeah, whatever.” You know, like, they’d stop listening. And these are actual and this is the past year. I feel, like, for this whole conversation that we’re having, things are changing, you know, as the years evolve. So, keep that into mind. I would say percentage of traffic for us from the blog right now is 75%. Andy: Percentage of sales driven through blog traffic, 62%. Andrew: That’s amazing. And how long did it take to get there? So, maybe, you know, how many years? How many articles per month are you writing? How big is your overall library of archived content? Andy: We have 10 years worth of archive. And before you go, “Holy crap. Like, I can never manage that.” Keep in mind that some of the older stuff is terrible, it’s not relevant or it drives irrelevant traffic, so, you know, because the business has changed over the years. So, just keeping that in mind, I think really…because Google is the person who’s going to benefit you the most from a blogging, kind of, marketing platform. And you really need at least six months to start seeing results from that. So, I would say at least a year for that. That could be, you know, a lot faster if you have other existing channels that you can put content into. Like, if you have a ravenous Facebook group or you have a really popular email newsletter, a blog can really elevate that. 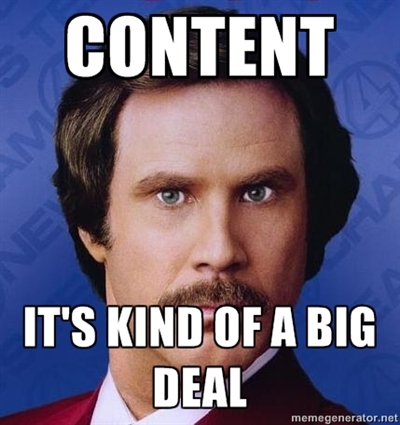 And, of course, for us, a lot of our sales do come from putting content into an email newsletter. But I would say at least six months to a year to get that started. This is not something where you can put it out there and nothing happens and you say, “Man, you know that Andy guy…like, that advice was crap.” No, you definitely need to give it some time and really, kind of, experiment with different things to see what’s gonna work for your customer. Andrew: You kind of alluded to times are changing a little bit. Things aren’t what they once were. And all of us are pretty familiar with Google, the ever-diminishing size of the organic search results pages. I mean, it’s obviously worked super well for you. What are your thoughts on all that? Are you as excited about blogging? Are you seeing the traffic diminish? I mean, you’re still getting a ton, of course, but have you seen that drop off a little bit? Where do you think we are? And how bullish or bearish are you on blogging, in general, going forward? Andy: It’s definitely more difficult. Like, if you have nothing and you’re starting from scratch, it’s gonna be a lot more difficult than it was 5 or 10 years ago. I think there’s still a lot of opportunity in the long tailed keywords. So, for those of you who are not familiar with that term, a short tail keyword would be, like, “eCommerce podcast,” whereas a long tail might be something like “eCommerce podcast on blogging and SEO keyword research.” Something, like, ridiculously long. Now, the long tail, you know, a few people are searching for them but there’s less competition. And I also think for eCommerce businesses, a lot of those queries are very specific. And if you can pair them up with a specific product, there’s a lot of opportunity there. I think the big challenge for bloggers is the style of content that people are preferring these days is changing. And a lot of people are moving to podcasts and people are having a lot of success with that. So, that’s kind of something you have to contend with. And this is not the time or place to debate, you know, whether you should have a podcast or a blog. You know, it’s like apples and oranges. And maybe you should have both. But I definitely think that that’s something to think about when you’re thinking about blogging content for your business. How do you compete with that? How do you put things out that are more suited for a written and photographic format than, you know, an MP3 format, for example? Andrew: Yeah. Keyword research, you mentioned, of course, the long tail and that’s where you see a lot of opportunity. How much of your strategy is focused around starting with a keyword in mind and writing an article for that versus saying, “Hey, we should…this sounds like something interesting. I’m gonna write an article and then I’ll go find a keyword to match that.” Do you have a strong preference one way or another? Andy: We do both. But I have to say, if you want to be successful at this, you have to be obsessed with keywords. You have to be obsessed. And so we do both and we really try to make sure that 90% of what we publish is optimized for a specific keyword. I mean, I would say 100 but, you know, once in a while there’s things that we do that are not specific to a keyword. Our strategy right now, because we publish three times a week, Monday, Wednesday, Friday, that’s probably what we’re gonna stick to for the time being. And it’s usually like a recipe, something about entertaining or mindfulness. And then we started doing, a couple years ago, just on Friday’s, it’s like an SEO post. It is literally an SEO post. Like, title says, like, “What to mix with green tea?” You know, “What’s the difference between English breakfasts and Irish breakfasts?” Like, they are literally keywords. And the thing is is I put them in our newsletter and they’re often the most popular item. So, you know, it’s like, “They’re driving the most sales, they’re really popular. Yeah, we should be doing these, like, all the time.” But the thing is if the blog was only posts that all had these, like, really, kind of, machine language sounding titles, that wouldn’t feel that engaging. Part of what really gets people, you know, sucked into our website for, like, 10 minutes is the fact that there are these,like mouth-watering photos of food and beautiful tablescapes and all these different, interesting ideas for how they can, like, spend their time with friends and family. And also, intermixed, are these things that are super keyword focused. So, you gotta have a balance of it. I don’t think you can be too soft on just, like, fluffy topics that really people aren’t exactly looking for. But at the same time, you know, really getting those keywords in there. Andrew: What’s your approach for keyword research, and maybe, a good threshold? On the long tail, you mentioned that’s where there’s a lot of opportunity. Maybe, a two-part question if I can throw a two-parter at you. The first one, what kind of tool do you use to look for this stuff? And secondly, what kind of threshold do you have? And do you find that those tools, a lot of times for those long-tailed keywords, underreport things? I’ll look at long-tailed keywords a whole lot of times and they’ll be spot on, exactly for, you know, I wanted to have an article, thinking about writing our podcast I’m thinking about doing, but they’ll get 10 searches a month. Or a lot of times, there’s, you know, zero reported search data. And I wonder if how accurate that is. I wonder if sometimes if it’s, you know, under-reported. So, what tools are you using and do you trust the data that they give you in terms of the volume on that long tail? Andy: All right. Well, I think none of us trust Google 100%. I think that would be just silly, silly. So, I don’t usually go after a keyword unless it says in the Adwords keyword tool over 30. So, like, one a day, right? I don’t do anything less than that, just because I don’t trust them, right? You know, what if it was 20? What is the keyword? Because if it’s, like, a perfect fit for something that you offer or, like, maybe it’s this versus that and you actually sell both items, it’s like a perfect fit, then, yeah, like, go for it if it’s 25. It’s kind of a, you know, requires some thinking to it. I have used a lot of the different tools out there in the past. And if you’re an eCommerceFuel member, not a paid promotion, like, there’s tons of coupons for these things in the forum. But I’ve used a lot of them in the past and find I always just come back to Adwords tool itself. And I feel like if you spend enough time in there looking for things, you’ll start to spot them. You’ll start to understand how to use the filters and, you know, sorting, you know, the table to find things more quickly. The other tools, I think, they just end up sending you on, you know, goose chases. I’d rather just get, you know, the data directly from Google and decide how much I trust it. Andrew: How do you build up a great content library of things to write from? Keyword research, of course, is gonna be, probably, the biggest part of that in terms of, you know, inspiration, things that are coming up in the content calendar. What other ways do you get ideas for writing content? Andy: Customer service questions. What do people ask you about? What do people, you know, like, go look at the actual emails, like, wherever they come in. You know, like, we have a generic mailbox that they hide in. And you know, so, looking at what people actually ask. How do they actually say it? You know, like, if they’re asking for something and you actually call it something else, it’s like, “What is that all about?” So, customers. Also asking customers. I try, every so often, to ask people, like, what are they interested in, what they’re looking for. You could do that depending on when you’re hearing this episode. But, like, at the end of the year, you know, you kinda do the survey or, you know, help us plan the new year. Just ask people what they think because people, you know, always want to give opinions, especially about something kinda light like that. Like, you know, “Hey, you know, we’re gonna blog a little more next year. What are you interested in?” I also like to read magazines and, like, other niches, not my niche. Because I think there’s very, oftentimes, you’ll see something that’s, like, really engaging for you or maybe not specifically for you but you think like, “Oh, that’s an interesting topic.” What if you changed it to your product area? Like, would it still work? I always find, kind of, interesting things that way. Andrew: I wanna move in a little bit into getting the content up and running, actually writing it and producing it. How much do you write yourself versus outsourcing? And if you do outsource, you know, have you had good luck with it and how do you find those writers to do a great job? Andy: I do not write much anymore. Probably, once a month because of time. It’s not the best use of my time. I try to because I, you know, as, kind of, the founder of a small business, people, you know, want to support us. They want to hear from me. But I think, you know, like, I was just saying, this interesting podcast topic would be a better use of my time than doing something about, you know, Earl Grey shortbread, which we have, like, three people who are very qualified and have much more beautiful kitchens to do that. So, it’s not the best use of my time. But we have very good luck. Everything is outsourced to writers. And one of them is a customer who turned into a writer, and then two of the others are just people that we had built relationships with over the years. And now we just always work with the same people. I really recommend that approach, finding someone that you like, get them up on your style and the way you want things done and then plan out, you know, your calendar from there. I think that’s the best way to go. I have not been super impressed with what I’ve seen from people using those sites where you just hire, like, you know, writers from a big bucket of…their hanging out in the cloud or whatever. That might work for some people, but I just think for so many people listening to this who have businesses that they’re really thoughtful about or they have products that they, obviously, have some attachment to. Otherwise, why are you selling this random thing? It makes more sense to develop a relationship with someone that you can just count on to understand your style and what’s important to you and then get them, you know, booked regularly and pay them. You know, we pay all of our writers. People can submit ideas to us to write and you can see, on our website, how much we pay. We pay new people $30 an article. People who have written for us for years, we pay a lot more than that. Pay them a flat fee, we don’t pay them per word. I don’t get into that game. That’s old school to me. Just pay flat fee. Pay people for a result, which would be, you know, content written to the length that you said, the kind of photos that you asked for, the links and product references that you want. Andrew: So, how much would you pay for a really good…you mentioned $30 for someone beginning, which is definitely, I would guess, on the low side. For someone who, let’s say someone, you’ve developed a great rapport with someone, they’re reliable, they write well, they know key really well because that’s obviously something important to you. What is a reasonable price to pay someone for, let’s say, just 1,000 word, well-written article for someone who has some industry background that you could kind of have an on-going relationship and give them regular work with? Andy: At least 100 bucks plus free stuff. Andrew: Got you. Okay. Interesting. Andy: Yeah. I mean, for us, you know, people hear that and they think, “Well, that seems a little low,” or, “that seems a little high.” You know, depends in your industry. For me, where I am with our business and the people that we work with, you know, we have figured out what the value is and how we can make sure people feel appreciated. Most of our writers have worked with us for years, years and years. And we pay them more when we can and we send them free stuff whenever we can, too. So, just figure out for you, like, what makes the most sense and communicate that. You know, don’t…one thing I do see people do that I don’t want you to do is like say, “Okay, we’re gonna pay you, like, you know, 20 bucks and if we like your work, we’ll pay you more.” Don’t just say that. Say, like, what you actually intend and what the criteria are. If you don’t actually intend on paying people more, then don’t say that stuff. So, just a little, like, kinda don’t do that. You know, writers have a tough life. And I think there’s a lot of websites that take advantage of them. So, like, be a cool person. Be a nice human. Tell them what you can afford. If they want to do it, super. If not, find someone else. Andrew: What about headlines? Headlines, in my experience, are the absolute hardest part of writing most podcasts or posts. I usually skip them and come back to them because I don’t want to do them. And I know, a lot of times with your headlines, some of the stuff you do is very SEO, just…you alluded to earlier, just straight up keywords. But other times, you know, I’m sure you’ve wrestled with this as well, like anyone doing content. Do you have an approach to that? Like, who writes that? Do you guys write it? Does the author write it? Do you have a swipe file? How much of the time do you try to write catchy headlines versus just writing straightforward, descriptive headlines that, maybe, aren’t quite as link baity. What’s your approach there? So, think of ways to make your headline very clear, have a lot of clarity. That’s my specific tip. You know, like, there’s so many blog posts out there with, like, how long it should be and should it start with how, what, when, where, why? And having verbs in the title, like, all of those things. And they’re true to a certain extent. But I think it comes down to…it’s an individual case for each piece of content and just making sure that you actually do think about it. As opposed to just publishing it and putting something up there. Think about what would be the best headline here. Andrew: What’s your checklist for when you have an author write a post and before it goes live, what has to be on it both from a, you know, maybe a writing standpoint, a copy standpoint but also from an SEO standpoint or an image standpoint, what are some of those major things that are on every single article that comes out on your blog? Andy: Well, we have a style guide that reminds people about how we like them to write and who our customer is. That’s kind of an aside point to what you asked, but I think is relevant because we do ask people to, you know, talk in a certain way or write in a certain way. You know, just thinking about, you know, breaking their article up into sections, etcetera. But for the checklists, we do have one and it is enforced heavily. I should have pulled it up. But the most important things on that, there is a reference and link to a product in every piece required. There is a link to an older article that’s required. You know, like, SEO there, Google likes that. We do ask them to think about the headline. Like, is the headline clear? The images. One of our biggest social outlets is Pinterest, so we do ask them to provide us an image that could be resized for Pinterest, which prefers the…I’m gonna get this wrong, you know, like a tall rectangle. Whereas, kind of on our website design, horizontal, across images display a little better. So, we actually need both. So, it’s kind of a weird, specific thing to us. Do you have the images? Is one of them vertical? Is one of them horizontal? Like, that kind of thing. If there was a keyword provided, which these days it’s invariable, we give them the instructions on how it should be incorporated. So, it should be incorporated in the beginning and then at least, you know, one or two more times throughout. And if they can get into the headline, super. But it doesn’t have to be. So, I think those are some of the key things. Andrew: What about with, you know, you get the articles, two or three per week going out. Do you guys do a long-term editorial calendar? And if so, why is it important and what should somebody think about if they wanna set one of these up, in terms of things that are important to get right to make it successful. But best “eCommerce Christmas gifts.” Okay. Well, people are gonna be looking for that towards the end of November. And if you want that to start ranking in Google and also if you have it out, you know, for an email list, it needs to be written no later than, like, the beginning of November so you have time to get it in there and publish it and edit the photos, all that stuff. I mean, someone needs to be writing it in October, which means you need to have thought of it and checked the keyword and actually know what it was in September. So, that’s just a simple example of how working ahead ensures that you are able to maximize your efforts. So, we do editorial calendar. And we kind of have it set up so that it’s just kind of a process we always follow. And so every month, kind of, the same things are happening. So, right now it’s October. So, next week it’ll be November. And so November, I will be writing down all the keywords and finalizing everything for January, even though there’s already…we have a kind of, you know, dock that has all the floating ideas. But I’ll say, “Okay, these are reality, and this is what’s really happening. This is what I can budget,” etc. And then those get assigned beginning of January. And then the writers are writing them at the end of January, beginning of Feb. And then they come in and they get loaded into WordPress so that they can be published in March. Andrew: You say podcasting sounds like a lot of work. Andrew: How long does it take you to do that? Maybe, people can apply their own little…you know, obviously, you’ve been doing this for years. You’re gonna be way more efficient at it than others. But how much time…it sounds like your big role is managing that editorial calendar, the topics, the keywords, delegating those out. Other people writing, other people loading it up, other people promoting on social. But for you, it’s kind of the puppet master in the nicest type of way. How long does it take you every month? Andy: Yeah. Well, so, we do a team retreat every year. And one of the exercises is we do try to come up with some ideas. And then just when I’m out in the world, like, I make a little note of things that I see and I put them on there. So, I’m always trying to, like, kind of fill the hopper, so to speak, so that when it comes time to sit down and do that, I’m not starting from scratch. I would say I probably spend, maybe 90 minutes. Sometimes it’s a little more, if I have trouble with the keywords. Andrew: And that’s one of the beauties of having, sorry to interrupt, but one of the beauties of having a fixed, kind of, roster of writers that you know well that are in the space. You can leverage their assets and their environments as well for really cool stuff. Andy: That’s right. That’s right. And we know their strengths, you know, their weaknesses, so to speak. I don’t really feel like they have weaknesses. It’s just like, “Oh, you know this person really excels with recipes they should get mostly that.” And so then, you know, I don’t think it takes very long to assign everything. It takes probably longer to type it all up in Asana, which is what we use to keep track of all this stuff. And then they all come in at a certain time. I do know that our marketing person takes, you know, a few hours to edit and do the photos and upload everything into WordPress and schedule all the social media. So, that’s not, you know, an insignificant undertaking. It’s batched so that helps a lot, right? Because writers know our expectations, they deliver them in the way that we want. And so just power through them. I author our weekly newsletter. And so I just pull everything up on the blog or if I happen to be doing it a little early that week, I log into WordPress and, you know, get the URLs if they’re not published yet. And that takes me an hour a week. But that also has, like, a marketing promotion and a letter for me. So, the hours do add up. But back in the beginning, you know, we’re really seeing a lot of results from it. So, we’ve, you know, committed to the investment. And each year, we really look at how to be more efficient and really optimize for the result. So, it’s not like it’s taking less time, you know, some things, maybe, now take more time but we are getting, you know, more sales each week from the things that we post. So, you know, it is an investment. Andrew: What’s your strategy for, maybe, moving from content over to promotion? How much do you promote your content after publishing? Do you primarily look at the blog as predominantly an inbound source of leads, it gets indexed as well, it’s obviously well-written but optimized for keywords and so, most, you know, 90% of that is coming from Google? Or do you guys do a pretty strong push in terms of sending it out on email? You mentioned social already, so I think that’s an element. Things like that. How much push versus pull do you have on the blog and how important is that aspect of it? Andy: Well, I think it’s crucial. I feel like the blog is the reason we can send a newsletter every week that people really want to read. So, it goes into our newsletter. It’s the core of our newsletter, which is the core of all of our marketing is this weekly email that we send. But also, you know, having these, kind of, appealing photos. I mean, anybody who’s been on Instagram for 10-minutes knows that food is super popular on Instagram. So, having, you know, a variety of things, not just this endless array of, like, piles of tea leaves or teacups gets people more interested in following what you’re doing. Because it seems like the way to stand out is to be interesting, to have, you know, something interesting to say or to share. And so that’s really the driver behind having all these different types of content and the way that we put them together so that, you know, no matter if you’re following us on the Instagram or, you know, you just read the newsletter that, kind of, you’re always looking forward to what we’re gonna say next. Andrew: Do you ever do any paid promotion, let’s say, Facebook advertising or any kind of paid promotion for your content pieces or do you usually just use your organic channels? Andy: You’re not paying attention. I always complain about Facebook ads in the eCommerceFuel forum. Facebook law…I just cannot. So, people are wondering what I mean by that. Like, our pay per click all goes directly to, like, a landing page or some sort of product itself. We have dabbled somewhat in Pinterest promoted pins because Pinterest is a…probably our sweetest spot in terms of social. But I still have better results than Pinterest with landing pages. So, I just haven’t. I just haven’t. And as far as the Google, well, I’m just gonna wait it out. We still are getting plenty of organic traffic, long tail so I’m not gonna pay to promote certain things. Plus, I feel like getting people from articles to products is still kind of a thing that’s changing. And we’ve changed how we do it several times lately and we’re still kind of understanding that. It’s a lot easier to get someone who’s reading content to sign up for a newsletter or some kind of email thing. And then we have…the email, like, we’re magicians at, you know, with the quality of the photography and balancing the promotion. So, no. To answer your question. No, no, no Facebook promo. Andrew: Well, you touched on, you know, getting people to sign up for the newsletter. How do you do that? What’s been most effective for you? I’m thinking from an eCommerce perspective, you land on a standard eCommerce homepage, a lot of times you’ll get hit with a pop-up for 10% off. That does not make sense to me as much on a blog page for something like what you’re doing. How much of your focus is spent on trying to get new subscribers that are just coming to the blog versus just trying to blast or market to the customers you already have? Have you found anything that’s been really…we could probably do a whole article on opt-ins and trying to get people to subscribe, especially kinda in the eCommerce realm, what has worked well for you and is that a big focus of yours? Andy: It’s for sure a focus. I think it’s crucial to making the whole strategy hang together. It’s changed a lot over the years. So, when I started, you gave away what’s called a lead magnet. So, you give something away to get people’s email address. And it used to be big things. Like, you give them a free eBook or you give them away a course. You know, like, a 10-day course on, you know, eCommerce blah, blah. And I would say, three years ago, we had to, like, pair down because it was like this arms race of the lead magnets. And so then it went to, like, simple things like a free one-page workbook or, “I’ll send you my 10-steps to, you know, making eCommerce business successful.” And now, I feel like it’s, like, even less. I have seen the best results with eCommerce, specifically, going the minimalist route and just not promising anything. I think our current and most successful opt-in says, “Sign up now to have more hope and encouragement in your inbox each Sunday.” That’s literally it. We’re promising people hope and encouragement. Well, who the hell doesn’t want more of that? We do not do the coupons. I think that’s a crap strategy. I feel like that’s lazy. I feel like that’s lazy, I’ll just say it. You’re just getting so many crappy people into that funnel. And I just think it’s not worth it. You’re also training them to always expect a coupon. I mean, I see a lot of eCommerce sites and I don’t even have time to figure out what exactly they’re selling and they’re offering me coupons. Lazy. And it also kind of reeks of desperation in a way. Like, “Please, buy something.” But I think there’s just so many better ways to do it. A lot of people are doing, now for their blogs, like, a content upgrade. So, there’s the blog piece and then what would be the next thing, which might be the whole thing packaged into a nice PDF with graphics and whatnot. And I don’t really think that approach is probably as successful for most eCommerce business owners, nor do I think that eCommerce businesses have a lot of really good options for lead magnets. Because a lot of times, right, it’s like, 10 things you need to know about using our product or X or Y. You know, people are just not excited about those offers anymore, you know, the lead magnet. It’s just not as effective. So, I really, strongly suggest people try and try it. You know, maybe your experience will be different. But whatever software you’re using, there’s a million of them out there for your pop-ups or the little opt-in box, try, you know, testing different things. But I really encourage you to have one that is, like, really simple. Like, go with the essentialism route and just say like…what do you send them every month? And you can say, you know, like, discounts or special offers or, you know, be the first to pre-order new products. But just keep it super simple, you know, just super basic and see what gets the most interest. Andrew: Love it, Andy. Want to do a quick lightning round with you here before we wrap things up. So, feel free to just, of course, as the name implies, just hit me with short, brief answers. If you had to identify one thing that you’re trying to optimize your life for right now, what would it be? Andrew: Oh, I like that one. Who’s someone you strongly disagree with? Andy: This one’s a tough one because I feel like that’s a long list. One that’s been my bug-bearer this particular week is people who don’t like libraries. Libraries are awesome. Andrew: Who doesn’t like libraries? Andy: I know. A lot of politicians, apparently, and people on Twitter. Libraries are cool, people. No matter how old you are or young you are. Andrew: How much money is enough? What would be your number of money in the bank? Andrew: What’s the worst investment you made in the last 10 years? Andy: Real estate. Don’t buy things in homeowner associations. Andrew: What’s the best investment, outside of your business, that you’ve made in the last 10 years? Andy: I would say real estate, again. But we were just talking before the call, in Portland, Oregon, housing is at a premium. And we purchased a home instead of renting and it’s actually cheaper. So, kind of funny little quirk of economy there. Andrew: And finally, what was the first CD you ever owned? Andrew: Nice. I was wondering when that one was gonna come up with people in the lighting round at some point. It’s a classic. Andy: I know. I can’t believe it hasn’t come up before. That’s disappointing. But I’m happy to represent. Andrew: We will come back. You’ll be the first but not the only one, I’m guessing, on that one. Well, Andy, this has been awesome, man. It’s cool to see such a blog that you’ve been able to create. I know few people that have as much success with their blog as you do. And I appreciate you’ve been willing to kinda let us in on some of your strategies. And also for just, you know, awesome of a community man from kinda leading the Portland ECF meetup to just being a stellar member in the forums, contributing a lot of stuff on a regular basis. It’s been a pleasure to have you as part of the group, man. So, thank you. Andy: You’re, quite, welcome. And I’ll just say in closing for folks who’ve been with us the whole way, you know, we enjoy the blog. I enjoy thinking about the things that I want to share with people. Our writers enjoy writing for us. We enjoy sharing the, you know, topics with people. So, in closing, if you really do wanna have, you know, more with your business and your blog, what would you enjoy doing? And try that first. Because if you enjoy it, then, chances are, your customers would, too. Andrew: Awesome. That’s a great parting shot. Thanks, Andy. Andrew: Want to connect with and learn from other proven, eCommerce entrepreneurs? Join us in the eCommerceFuel private community. It’s our tight-knit, vetted group for store owners with at least a quarter in million dollars in annual sales. 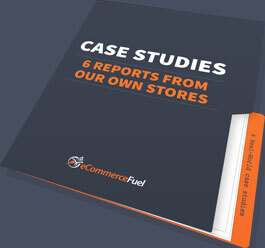 You can learn more and apply for membership at eCommerceFuel.com. Thanks so much for listening, and I’m looking forward to seeing you again next time. it was an interesting read. So called “truths” are changing rapidly… works one day and it does not on the next one. I have to agree, FB ads are the biggest money burning ever unless you are spending A LOT. Btw, in my practice I noticed a strange thing: I have a webshop and blog at the same domain. Niche area (music industry, products purchases are triggered by emotions rather than problem awareness, kind of lifestyle products), some 80-300 visitors a day after 1.5 a year, but most of them lands on the blog and reads articles there. Articles have links to products, all have a usp and the products are not available anywhere else. Blog content is made around keyword but more around thematic topics, following the latest seo trends. The main point it tries to be educative, entertaining, so overall offering value. The blog articles are quite popular and shared, yet they seem to cannibalize the shop content, so a very few purchases made from blog clickthroughs. However when I release a new product and the buzz is happening around the product, they sell well for around 2-3 weeks, then fade out (marketing is intermittent, not everyday task.) to sporadic purchases. Customers love the products as well, I rarely get less than 5 star reviews. What is the way to converting readers to buyers? More time? More articles? More brand-building? I’d like to hear your opinion about this.